We're not big flavoured soda/soft drink fans, however, we do drink a tonne of soda water. 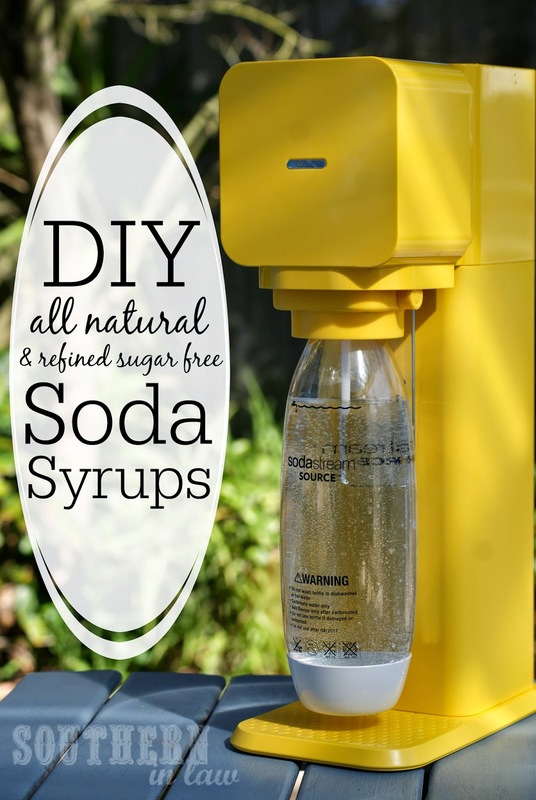 For ages we were carting bottle after bottle of soda water home from the supermarket (and recycling bottle after bottle every week), however, we found an easier, more affordable and more environmentally friendly option - SodaStream! For a household of soda water lovers, the SodaStream Play was an instant hit and we constantly have a bottle made up in the fridge. The SodaStream Play is one of the latest models and we think it's super cute with its fun retro look - we chose a bright lemon yellow which is perfect for summer, however, it's also available in five other colours including red and grey! 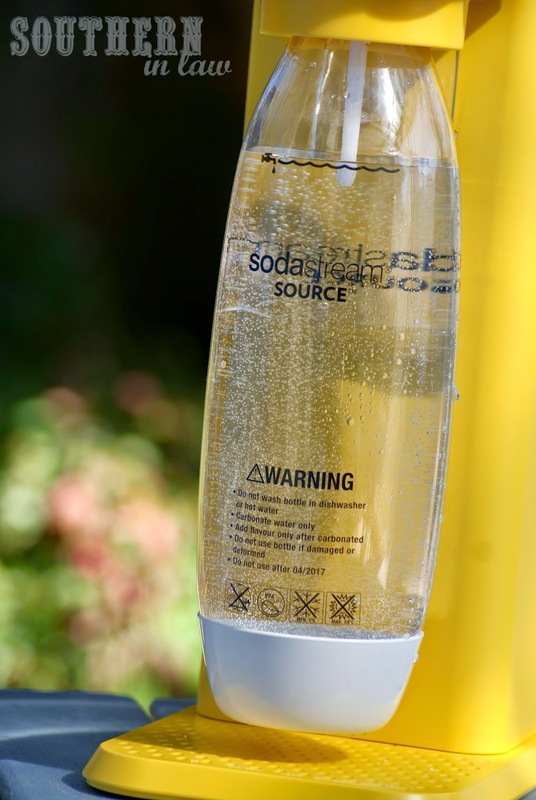 The Play is the first SodaStream drinks maker to have the cool "auto-lift" slider and "snap-lock" mechanism so making a bottle of soda water is super simple. Just fill the reusable carbonating bottle to the line with water, pop your bottle into the machine and press down 2-3 times to carbonate. For best results, refridgerate the water prior to carbonating - that way it's super fizzy! Best of all? You can add a little bit of designer style to your home for just $99 because this gorgeous machine was designed by the legendary Yves Behar. But not everyone likes plain Soda Water - and not everyone wants a sweet drink that's overloaded with sugar. 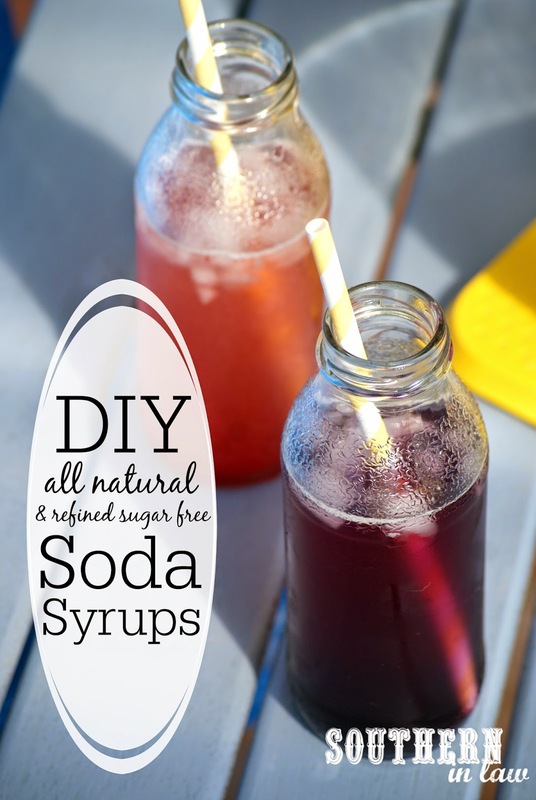 Sometimes it's nice to enjoy something different, so I decided that I wanted to create my own healthy, refined sugar free soda syrups to enjoy with friends. 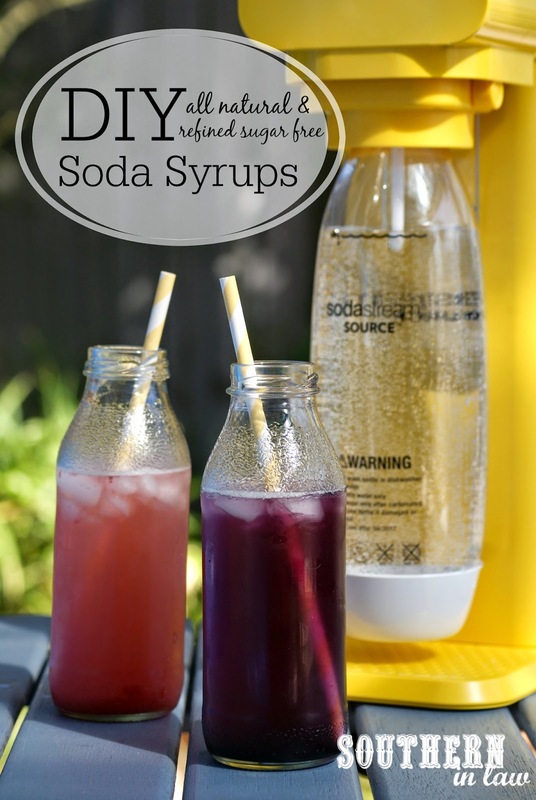 Whilst SodaStream have their own Flavours (with great low sugar options!) I wanted to make something a little bit special - my own DIY Soda Syrups that were full of flavour without being full of sugar. So I set to work to create something delicious - and I succeeded! I came up with a super simple method for making a refined sugar free syrup using just about any type of fruit. For our friends, we created two special drinks - the Blueberry Fizz and a Strawberry Sparkle. They are super refreshing and can be tweaked and changed to create whatever you like. For the more adventurous drinkers, I added in some fresh herbs for a flavour boost whilst others chose to keep it simple. The best thing about these syrups is that you can add as much or as little as you like - it's totally up to you! All you've got to do is add some syrup to the bottom of your glass and top it up with a fresh bottle of Soda Water made in your SodaStream. 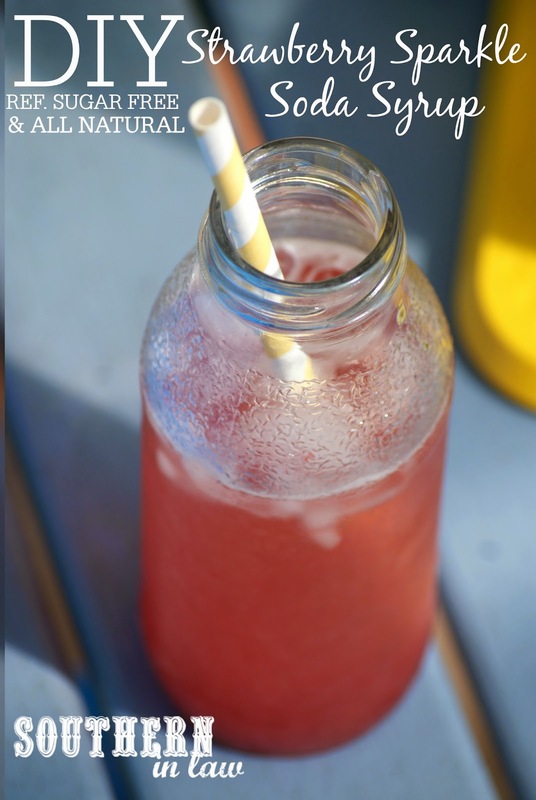 They're a huge hit with kids and adults and are the perfect summer drink. Because they're so quick and easy to make, I know they'll be making a regular appearance at the SIL house! Place all of your ingredients in a medium saucepan over a high heat. Bring to the boil and reduce the heat to medium, allowing your syrup to simmer until reduced. Whilst simmering, squish some of your blueberries with a fork or the back of a spoon to squeeze out the juice. Place a sieve over a bowl and pour some of your blueberry syrup on top, pushing the mixture through the sieve*** and repeating until you've gotten all of the juice out. Discard the blueberry skins and pour your syrup into a glass jar or container until you're ready to use. All you have to do is add a tablespoon or so of syrup to the bottom of your glass, fill it with your SodaStream Soda Water and enjoy! Use as much or as little syrup as you like! The syrup will keep in the fridge for 1-2 weeks. 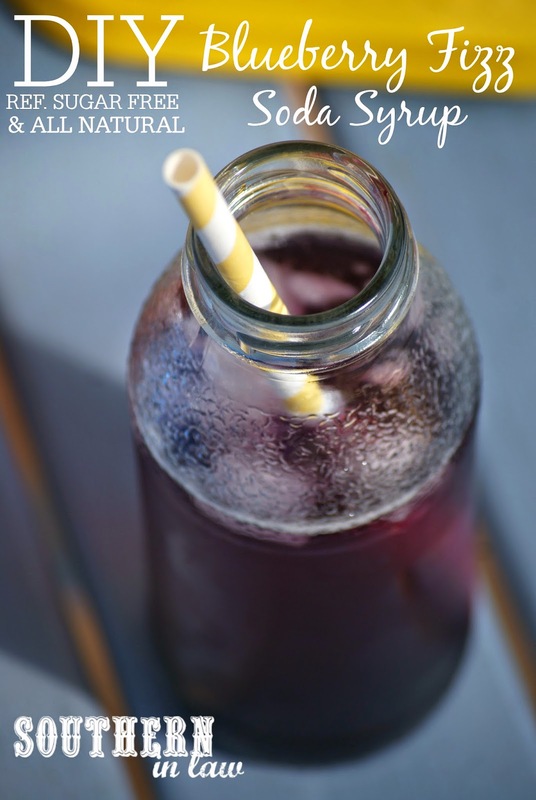 *You can use fresh or frozen blueberries, either will work just fine! **Adjust the maple syrup to your tastes and the sweetness of your blueberries! ***If you don't mind a bit of added texture, you can leave your blueberries whole and add them to your drink - or puree the mixture in a blender. Place a sieve over a bowl and pour some of your strawberry syrup on top, pushing the mixture through the sieve and repeating until you've gotten all of the juice out. Discard the strawberry pulp and pour your syrup into a glass jar or container until you're ready to use. *Adjust the maple syrup to your tastes and the sweetness of your strawberries! Get creative and tweak the syrups to your liking. We added a handful of mint leaves to our blueberry syrup and a handful of basil leaves to our strawberry syrup whilst cooking for an added flavour boost, however, you can change up the fruits (think orange, lemon, lime, raspberries, blackberries or a mix of berries) or add in whatever other flavour additions you like! Serve them as is or mix up your own flavour combinations - the choice is yours! But tell me, what's your favourite soda flavour? What's your party drink of choice? And what flavour combination screams summer for you? This was a sponsored post for SodaStream. All opinions expressed in this post and recipes are completely our own and have not been influenced by the company in any way. If you're interested in working with Southern In-Law on a sponsored post, please contact us at southerninlaw@gmail.com for more information. what is a substitute for ricotta? I added cocoa powder and a packet of splenda. Blended it with my food processor for a smoother texture. YUM! So glad you loved the recipe, Susan! Your additions sound perfect!